At this time we are seeing continuing propaganda operations of Iranian government that is trying to convince with its proclamations the public opinion regarding technical capacities in its possession. Military troops, nuclear weapons, and a cyber army ready to destroy any enemy stronghold in cyber space. Too much experts believe that in reality, the West rather than being concerned about the direct threat of Iran is literally paralyzed by the specter of two nations too close to the government of Ahmadinejad, China and Russia. At stake is the economic balance of the biggest world market, too important for western capitalism and that rapresent an indispensable opportunity. Is it true? U.S. and members states of the European Community know the value and potential of this market at a time of great crisis, that is why they prefer adopt an international policy not aggressive and that tends to forgive unacceptable behaviour of countries like Syria and Iran. Are we aware of the economic and political impact of a so reckless conduct on the internal situation? The mediatic exposure is certainly very challenging because it requires a commitment of central government in terms of defense very costly, counter-trend compared to what we are witnessing in European countries like Italy where these expenditures have been reduced dramatically. Iran is operating under different profiles in terms of diplomacy, weaving relationships and alliances with countries opposed to the U.S. dominant position. What worries most is this aspect that would allow to the government in Tehran also to procure weaponry technologies not otherwise obtainable. The close cooperation with Syria, for example has always been a channel of choice for the subterranean dialogue with countries like Russia, the Moscow government in fact is closely linked to that of Damascus for the supply of defense systems. Oil reserves in Iran, according official sources government, rank third largest in the world, although it ranks second if Canadian reserves of unconventional oil are excluded. This is roughly 10% of the world’s total proven petroleum reserves. Iran is the world’s fourth largest oil producer and is OPEC’s second-largest producer after Saudi Arabia and this confer to the Country an enormous economic power, but it is also true that it is a good motivation to consider Iran as an enemy. We must recognize that Iran have understood the importance of its cyber presences addition to the ordinary military, that is why its government is recruiting groups of hacker in the Middle East in the name of Jihad against the West Enemy. Thanks to the strategic position under the energetic perspective Iran is really close to that Eastern countries where energy demand is greater. For example, China’s oil trade with Iran is know has normal commercial activity, many intelligence specialist are convinced that Chinese government has contributed to cyber training of Iranian special units that were engaged in computer raid against Israel and other nations guilty of having relations with the West oppressor. The People’s Republic of China is the world’s most populous country and the second largest oil consumer, behind the U.S. , a machine that consumes energy. 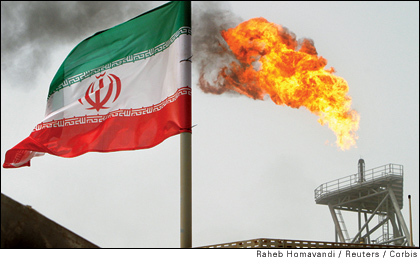 China is one of the main oil and gas importer from Iran. While the U.S. and EU were opposing to Iran’s nuclear program, China signed in October 2004 its largest energy deal with Iran ever. China is not officially against the Iran’s nuclear program and this position indicates that China is interested in a militarily leadership of Iran in the Gulf due its energy needs. U.S. intelligence officials indicated that Iran is prepared to launch terrorist attacks inside the United States while in the past it was responsible of attacks overseas. How and when this attack could became reality? The increasing interest in the warfare of Iran suggest that it could try to attack the U.S. first in the cyber space to destabilize the country, they are dreaming a cyber 11/9, but is it possible? Is is possible that a cyber threat could causes so critical damages? Unfortunately yes, the events of this days have demonstrated that with a well written virus it’s possible to infect million of machines using them to attack institutions or critical infrastructures. This last point is really worrysome, the US ad also other western countries have a lot of critical infrastructures, like nuclear plants, facilites, telecomunication systems, that can be target of attacks. The security level of these structures today is certainly not very satisfactory and the U.S. government is working on this, conscious of the threat. Iran has capitalized the lesson from the Stuxnet case, on how could be dangerous a cyber weapon developed to attacks specific target and maybe it is working on something like that. European firms that play a key role in nuclear power and other critical sectors have been targeted by a cyber espionage attack based on virus Stuxnet like. The risk that new intelligence-gathering tool have been developed to infiltrate computer networks with the intent to steal confidential information and potentially reveal vulnerabilities that could be exploited in later attacks. No matter who is really behind this attacks what is allarming is that those person could be engaged to target US or European target, like other sectors infact there is the concrete risk that groups of cyber mercenaries could support hostile governments in the development of cyber weapon. Will we be willing to wait for the day when nations like Iran will become truly out of control? Can we still allow to Russia and China to prohibit military operations against states like Syria and Iran? Obviously not, and the proof of this is in the words of the Defense Secretary Leon E. Panetta during an interview with CBS’s “60 Minutes”. He said that Iran was probably one year away from being able to build a bomb. He added that it could take a year or two beyond that to develop the ability to deliver a warhead by missile. That is the point of no return in my opinion, that why we could assist to an escalation within next year, but it is impossible to make any forecast of the events due the complex scenario. KPN hacked, who and when warned users?